Length: Up to 250 cm. Distribution area: In Thailand, the Ridleys viper exists from Chumphon up to the Malayan border. Description/Behaviour/habitat: The body is white to light yellow in colour. On the last third of the body there are two black stripes and one yellow-beige stripe. The top of the head is grey-blue and they have black bands from the eye to the edge of the mouth. These snakes mostly live in caves where they feed on bats. However every now and again, they are seen outside of caves. 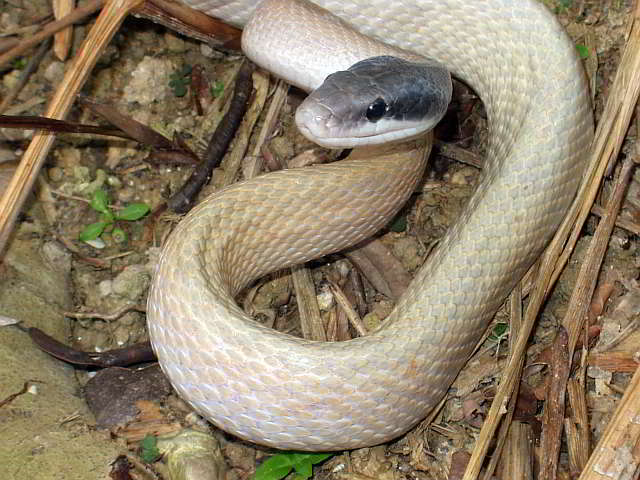 Othriophis taeniurus ridleyi is mainly active at night and at dusk. If threatened, they position themselves into an S and snap at their predator. Danger level: These snakes are completely non-venomous and are under protection in Thailand. Bites are relatively painful and bleed a lot due to the size of the snake. Distribution area: The snake is found in north and west Thailand in flat countryside and in hilly areas. It seems that she prefers higher elevations from about more then 300 meters above sealevel. Habitat/behaviour: Othriophis taeniurus helfenbergeri is active at dusk and at night. It inhabits forests and can be also found in caves, same as Othirophis taeniurus ridleyi Their main food consists bats, rats and mice of which they eat large quantities. Othriophis taeniurus helfenbergeri is a fast and aggressive snake. When threatened, it will rear up head first forming the body into an “S” shape. If you encounter the snake in this situation remain very still. The snake will quickly calm down and slither away. Helfenbergs racer lays between 8 and 16 eggs in February and March depending on the size and age of the animal. Under normal conditions, the young emerge after approximately 75 days. 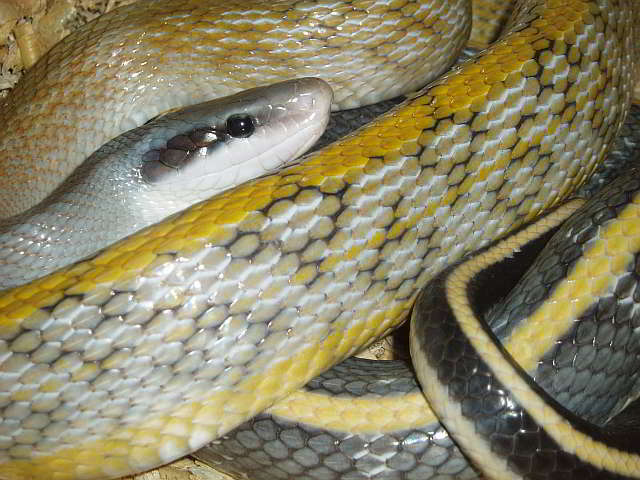 They resemble the adult snakes but are somewhat more intensively coloured. Due to their large appetites, the young snakes can grow up to 160 centimetres within two years. Males are usually smaller than females and on average, are no more than 130 centimetres. Othriophis taeniurus ridleyi (Ridley's Racer) is easy to distinguish from Othriophis taeniurus helfenbergeri because it is considerably darker in colour. Other than this, Othriophis taeniurus ridleyi is also only found in southern Thailand. Danger level: Because these snakes belong to the “real rat snakes” they do not have venomglands and are therefore harmless to humans.